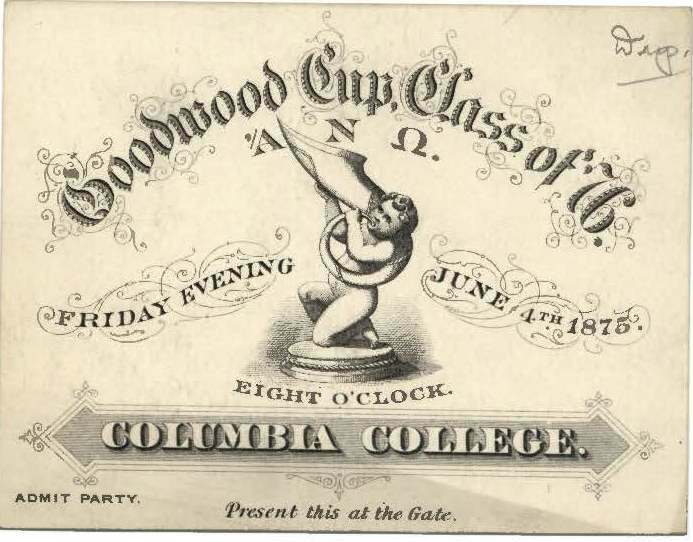 In 1864, the Columbia College graduating class decided to give an award to its most popular member. Other awards were presented to the class members by the alumni association and by the faculty; but this one would be given by the members of the class themselves. And thus, the Goodwood Cups, a not-long-term tradition, was born. Thanks to the efforts of T. Arthur Booth, CC 1878, there are now 12 of the 15 Goodwood Cups in the University Archives holdings. The Cups’ name comes from its most likely model, those awarded at the popular races at Goodwood Park in England. The first recipient of the Goodwood Cup was Joseph Bayley Lawrence, Class of 1864, followed by Seymour Van Nostrand, Class of 1865. In 1866, the Cup was presented at the end of the junior year and so it became a tradition for the junior class. 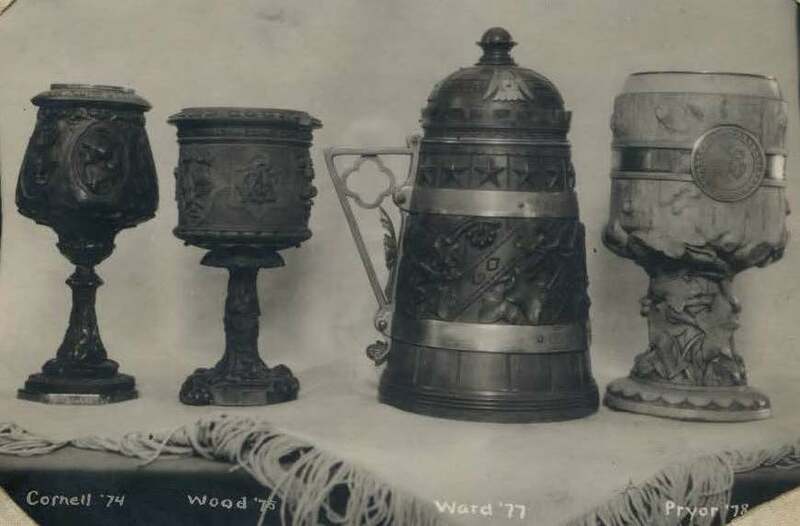 The Cups were specially designed each year (for example, S.A. Reed 1874 designed the 1873 Cup) and they were made from different woods (oak and butterwood) and in different shapes (goblets and steins). The presentation of the Cup was normally held in June and it involved a speech by the winner, followed by a dance, and then a stag drinking party for the members of the class. The Goodwood Cups, however, proved to be a short-lived tradition. The last Cup was given in 1877 to James W. Pryor 1878. Class politics had become an issue and the manner for securing votes and campaigning led to much resentment and hard feelings, all extensively covered in the student newspaper, the Spectator. The following year, the Class of 1879 refused to award the prize and so too the next two class years. Classes would eventually find other ways to recognize their own – such as the Senior Poll included in the yearbook. 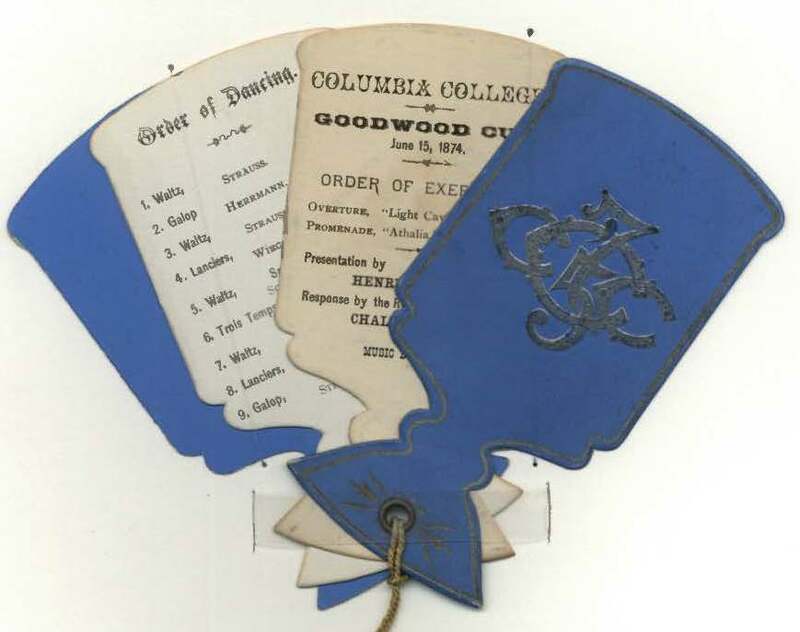 In 1919, Robert C. Cornell’s 1874 Goodwood Cup was returned to Columbia. Soon after, T. Arthur Booth (CC 1878, P&S 1882) started an effort to track down all of the Cups and have them become part of the Columbiana Collection. By 1925 only one of the original recipients was still alive. Through an extensive letter writing campaign, Booth was able to bring the total number of Cups at Columbia to 12. Of the remaining 3 cups: one could not be found but the silver engraving was secured (Cup of 1864); one was willed from father to son and was on loan once at the University (Cup of 1868); and only one was completely lost and unaccounted for (Cup of 1871). This entry was posted in Uncategorized and tagged Columbiana, Goodwood Cups, Robert Arrowsmith, Robert C. Cornell, T. Arthur Booth, The Columbia Spectator on April 11, 2018 by Kimberly Springer.